WINNIPEG (November 30, 2015) – Canada's biggest party, the Grey Cup, continues to be one of the biggest events on Canadian television, growing 6% compared to last year according to preliminary overnight data from Numeris. 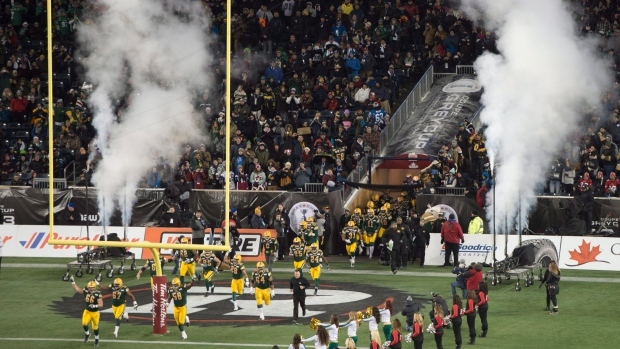 An average audience of 4.3 million viewers tuned in to TSN and RDS to watch the Edmonton Eskimos win a hotly-contested clash with the Ottawa Redblacks in last night's 103rd Grey Cup presented by Shaw. Overall, 9.7 million unique viewers, or nearly 30% of the entire Canadian population, watched some or all of the 2015 CFL championship game on TSN and RDS. Audiences for the 103rd Grey Cup presented by Shaw peaked at 5.5 million viewers late in the game as Edmonton scored a clutch goal line touchdown to take the lead for good in the fourth quarter. Fans of the winning team rallied around the 103rd Grey Cup presented by Shaw, as the game became the highest-rated program of the calendar year in the Edmonton Extended Market, with 66% of people watching television tuning in for the broadcast. The 103rd Grey Cup presented by Shaw becomes the 19th program in the history of TSN to average more than 3 million viewers. The electric halftime performance by multi-platinum rockers Fall Out Boy during the Nissan Titan Half-Time Show attracted an average audience of 3.8 million viewers. An average audience of 1.8 million viewers stayed to watch TSN's extensive post-game coverage.